This entry was posted in Arguments and tagged mad max, mad max: fury road, movies. Bookmark the permalink. I loved Fury Road also. I loved it for the same reason I loved Dredd: it knows its place and focuses on what it’s good at. Which is being a mighty damn fine action movie. Characters are tight and subplots dart about: but the simple story is a steaming juggernaut pounding through the desert. It’s always present, always the primary motivation. 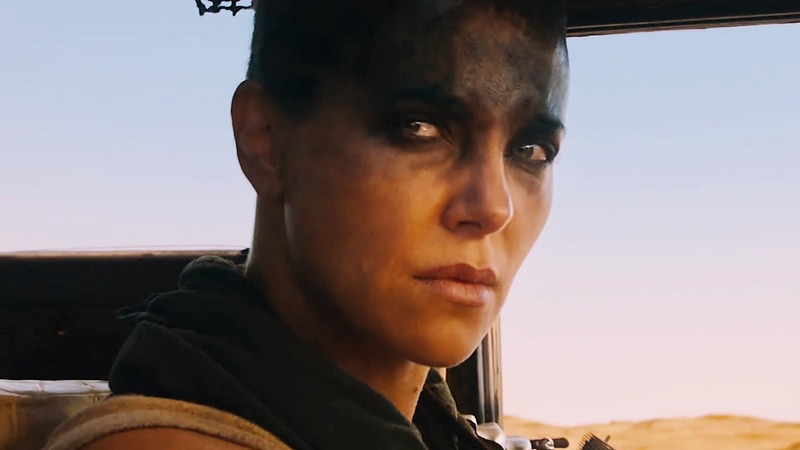 Yeah, this is Furiosa’s story, and as you point out Max is a sidekick. For my money, though, it distinguishes itself from the pantheon of action movies not through the heroics of a powerful individual (though it clearly has those), but through the interplay of a team. Playing both on uncertain alliances and common goals, it’s the GROUP which makes Furiosa’s team strong. It’s surprised me since that I can’t think of another film where teamwork is so emphasised. There’s always a moment when Hero A saves Hero B and drops a witty quip – but a whole movie based on that premise, and without the quips? A rare machine. I think action movies are, and always have been, aimed very much at men. I’ve become increasingly aware of this over the last few years but it’s never really bothered me. Why should it? The movies are aimed at me and I tend to enjoy them – although clichés get boring and token female characters are often an annoyance. And if my female friends don’t enjoy the action movies I do, well, that’s not really a problem, is it? They have films they enjoy, after all, and we’re just talking about cinema. But then I wonder… are we? I think traditionally and subconsciously, action movies tend to be male power fantasy. I don’t consciously embrace this at all, and I’m not the biggest action movie fan by a long-shot. And yet these films play on tropes and themes which suit me, and are probably deeply ingrained into my psyche. I may find them dull, hackneyed, unnecessary and ridiculous – but I rarely find them uncomfortable. Far from it; stick Die Hard on in the background and the world feels like a slightly more bearable place. These films tend not to be so welcoming to the female experience: in which, at best, a single Strong Female Woman will overthrow expectations until she is captured or killed. Or yes, (and even worse), married. Fury Road provides a really welcome change of pace to all that jazz. I’ve never known many girls who really enjoy action movies as a whole, like guys do. It’s something I’ve always just tacitly accepted, but why should this be so? I’m always interested in innovation in storytelling and seeing new stories and patterns in films, and better roles for women (and yeah, more diverse roles for male heroes, too) are welcome changes which would improve my personal enjoyment of action films. And mainstream movies in general. But there’s a deeper problem running beneath this – a social issue which says action movies are by men, for men, a subliminal reinforcement of the patriarchy. I’m not so much into that. Hmm. Well, I think that’s enough Male Voice for one lifetime. Cheers! Thanks for writing this post. I haven’t seen Fury Road but have read plenty of accolades – at least in byte-sized form – and have wondered how it’s not just another action movie. Thanks for explaining what makes it good.